This Fish Pasta Bake (a.k.a. 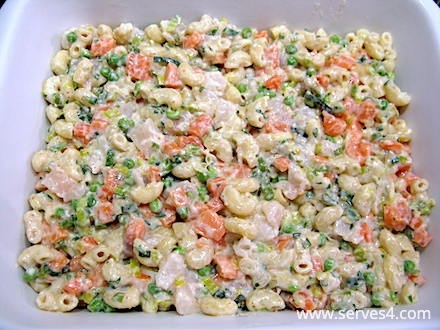 casserole), is easily transformed into a quick pasta recipe, despite its many components, as much of it can be prepared in advance, leaving only the assembly work before baking. 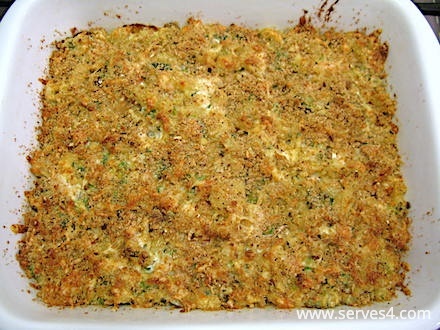 This dish is a nice alternative to the traditional fish pie and is a great way to introduce various kinds of fish to baby. 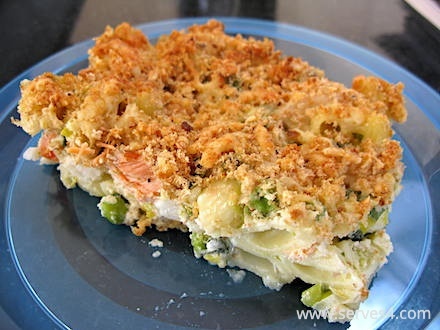 Most kinds of fish, including cooked shellfish, can be added to this bake, although it is probably best to avoid oily fish, such as mackerel, which doesn't really go well with white sauce. For babies just starting out on fish, try a combination of salmon and a white fish (I used haddock in this recipe). For older babies and toddlers, you can be more adventurous in your fish combinations. There are also numerous ways to customise the vegetable offerings in this dish, although I have used carrots and peas. Feel free to use whatever baby prefers, such as chopped spinach or kale, green beans or broccoli, or whatever is in season! To turn this bake into a quick pasta recipe, prepare the various components in advance when you have a few spare moments. For example, the vegetable mixture can be cooked in advance and set aside, and the fish can be prepared and chopped, then covered and refrigerated. 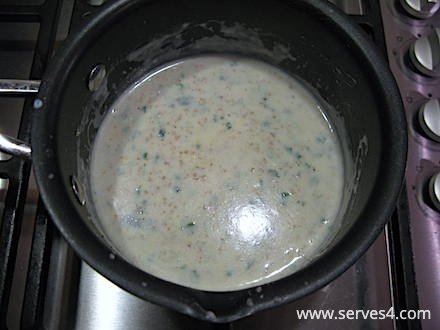 The white sauce can also be made well in advance and covered until ready to use. This leaves only cooking the pasta and assembling the bake to do before sticking it into the oven - easy peasy! 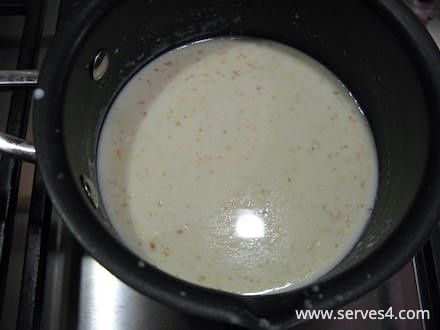 I have used wholemeal flour in this recipe to prepare the white sauce (that was all I had! ), as well as wholemeal breadcrumbs for the topping. Whilst the wholemeal flour doesn't look as nice when making the white sauce, it doesn't make a bit of difference to the taste of the dish. 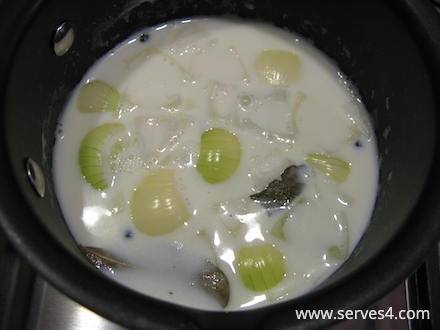 Add the milk, onion, bay leaf and peppercorns into a small saucepan, and bring to just below boiling point. Set aside to infuse whilst you prepare the fish and vegetables. Preheat the oven to 190C / 170C Fan, and lightly grease an ovenproof dish with some butter. Heat the oil in a frying pan over medium-low heat. 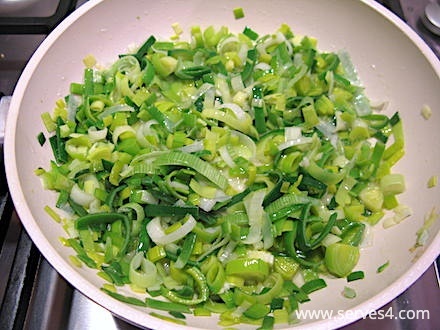 Cook the leek and garlic for about 10 minutes until soft, stirring occasionally. If your fish still has the skin on, remove the fillets from the skin, and check carefully for any small bones that may remain. Cut the fish into small chunks, and set aside until ready to use, or cover and refrigerate, if preparing in advance. Strain the warm milk, and discard the onion, bay leaf and peppercorns. 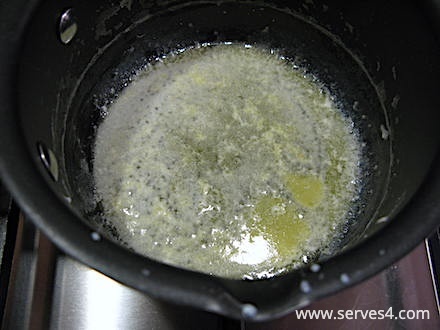 Melt the butter in a small saucepan until foaming. 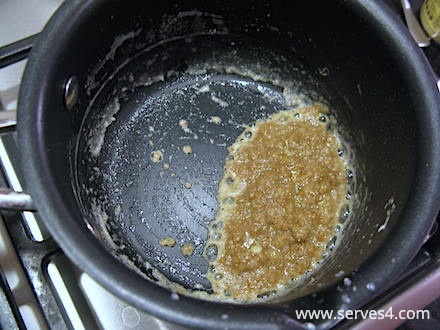 Stir in the flour to make a smooth paste, and cook, stirring constantly, over a low heat for a couple of minutes. Remove the pan from heat. Pour in a bit of the flavoured milk, and stir vigorously with a spatula or small whisk, keeping the mixture smooth. Continue doing this until all the milk has been used. Return the pan to low heat, and bring to a gentle simmer, stirring often. Cook for a couple of minutes, stirring continuously, until the sauce thickens. Turn off the heat, and add the parsley and mustard, mixing well. You may also add seasoning for older babies and toddlers. If preparing this in advance, cover the surface closely with cling film to stop a skin forming, and set aside until ready to use. This is a quick pasta dish to assemble, so much time can be saved if you have prepared the various components in advance. 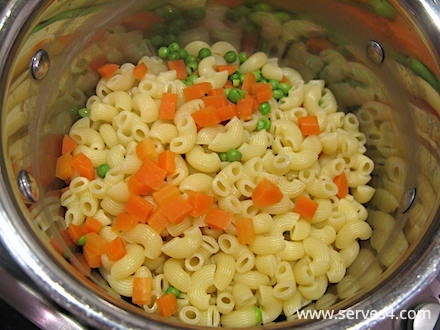 Boil some water in a medium saucepan, and add the pasta, carrots and peas. Cook for a minute or so less than the instructions on the pasta packet, so that it is marginally underdone. Add the white sauce and leek mixture to the pasta, and stir until combined. Fold in the fish, and transfer to the baking dish. 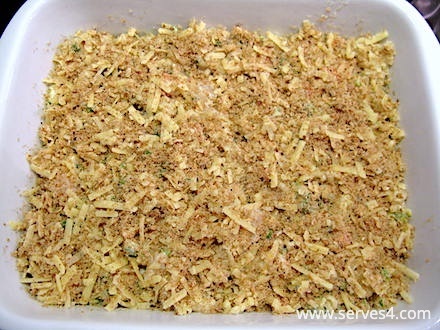 Mix together the breadcrumbs and cheese, and sprinkle evenly over the top. Bake in the preheated oven for about 25 minutes, until the top is golden brown and the sauce is bubbling. Allow sufficient time to cool before cutting into slices and serving. You may wish to mash it slightly before serving to smaller babies.